On October 15, 2012, a young man from Bangladesh named Quazi Mohammad Rezwanul Ahsan Nafis parked next to New York Federal Reserve Bank in a van with what he believed was a 1000-pound bomb, walked a few blocks away, and then attempted to detonate the bomb by mobile phone. In fact, the bomb was a fake, supplied by undercover agents for the United States FBI. The agents, posing as radical jihadists, had led Nafis along for months, allowing him to believe they were fellow terrorists and gathering information about his plot. The cover was maintained until the moment when his bomb failed to detonate, and Nafis was arrested. Disaster averted. Researchers at IIASA study many risks to society, from floods, hurricanes, and natural disasters, to the impacts of climate change on future generations. They use models that can help disentangle the costs and benefits of different policies that could help prevent damage or deaths, or mitigate the impacts of global problems like climate change and air pollution. Could the same techniques apply to the dangers of terrorism and jihadists attacks? Could systems analysis help inform intelligence agencies in order to stop more terrorist attacks? Yale University Professor Ed Kaplan has done just that in work that he presented at IIASA in late December 2013. His research, which has intersected with IIASA in the past through collaborations with former IIASA Directors Howard Raiffa and Detlof von Winterfeldt, uses operations research to find ways to improve intelligence operations so as to catch more terrorists, before an attack can take place. Kaplan, an expert on counterterrorism research, refined a simple economic model of customer service, known as a “queuing model” to instead represent the evolution of terror plots by terrorists, and interaction between the terrorists and the undercover agents who are working to uncover those plots. “The best way to stop an attack is to know it’s about to happen beforehand,” says Kaplan. That means, in large part, having enough agents in the right places to detect attacks. But how many agents is the right number? At IIASA, Kaplan described his terrorist “queuing model,” which can be applied to show how much a given number of agents would be likely to decrease attacks. Queuing models are an operations research method used to understand waiting times in lines, such as what happens at restaurants, offices, telephone queues or even internet servers. But in the standard model, customers want to be served, and the servers know who the customers are. In Kaplan’s terrorist model, the terrorists – customers –don’t want to be served, and the servers—the agents—don’t know where their customers are. By modifying the model to account for those differences, Kaplan can answer some tricky questions about the best way for intelligence agencies to fight terrorism. “Even if you don’t know how many terrorists there are or where they are, you can make it more likely that they will show themselves, you can make it more difficult for them to carry out an attack,” says Kaplan. 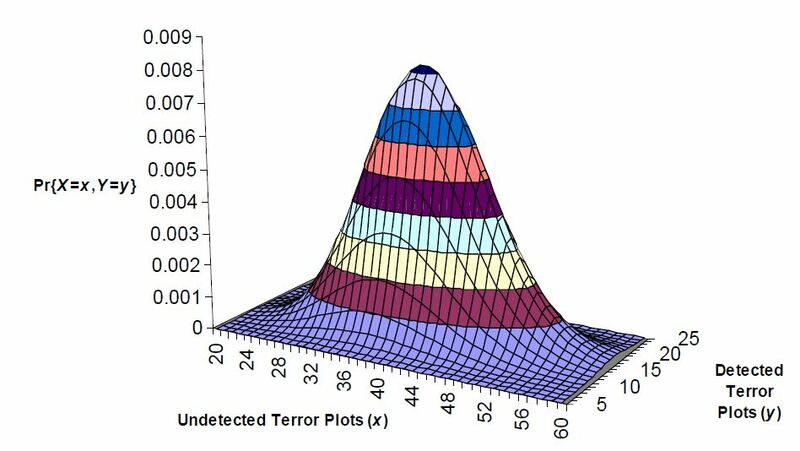 Kaplan’s method provides estimates of the numbers of undetected terrorist plots, as well as what it would take to increase detection rates. Using data from court records of terrorism cases, Kaplan refined his models to include the average time that a terror plot is active – that is, the time from when a terrorist group first starts a plot, to the time that they are either caught, or the attack takes place. Based on the data, he could then calculate how many terror plots were likely to be in progress at any one time. He could also estimate the probability of detecting those plots, and how much that probability could be increased by employing more agents. For example, the model calculates that by increasing FBI agents by a factor of two would increase the detection rate from 80% to 89%.